Those times have passed and my gastronomic choices have changed – especially while living in Italy, a country where sometimes I forget to eat meat due to the endless, tasty, and hearty vegetarian choices you can have. 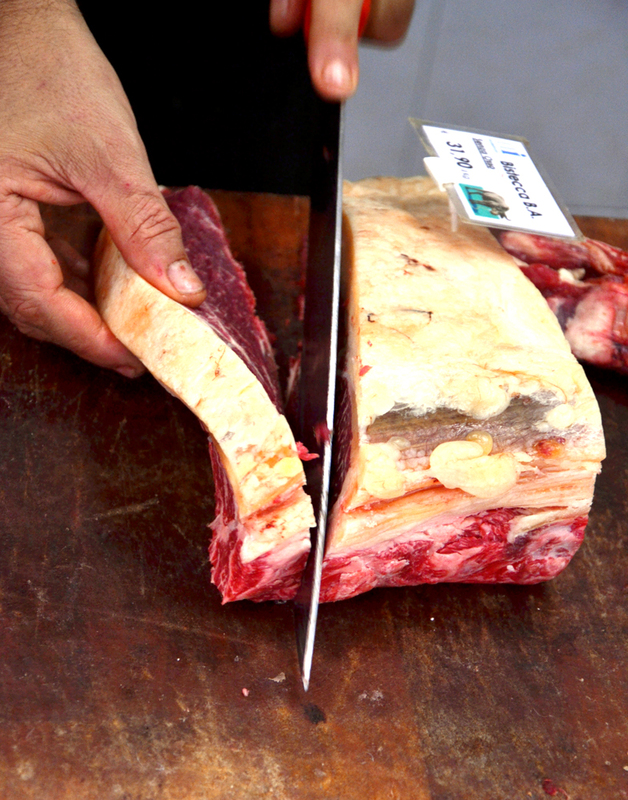 At the source – the Butcher! But of course, you cannot deny where you come from and sometimes I feel like eating red meat!!! Since I do not eat steak quite often, when I eat it, I treat myself with a serious piece of steak. 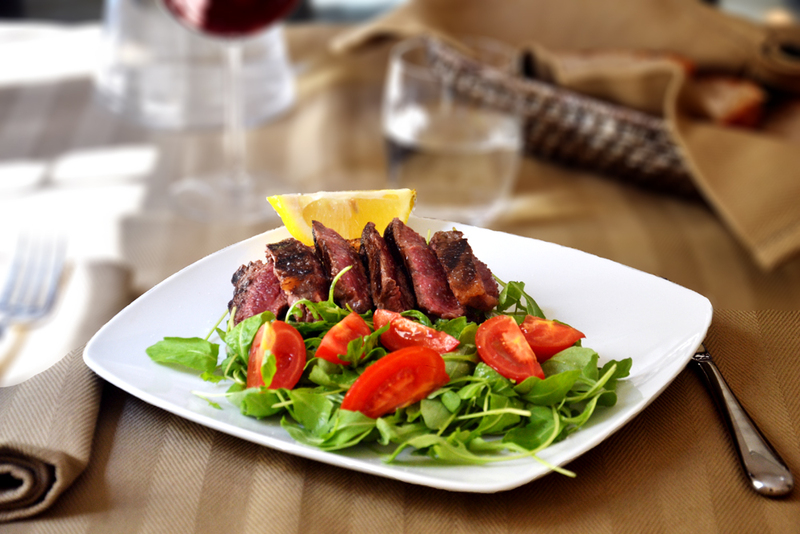 As far as side dishes with steaks, I agree with Rosemary – from the amazing blog Cooking in Sens – who prefers her steak with a light salad. I think steak should be the “only star” here! In this occasion, I cut my steak into trips, and placed them on top of fresh grilled country bread because I said to myself: “What about the delicious, steak drippings that we sometimes leave on the griddle?” …the answer was: bread will absorb them!!! Yummy!!! In a griddle place bread slices until golden. Set aside. In the same griddle, heat extra virgin oil over moderately high heat until it begins to smoke and add steak. I rather have my steak medium – but you can cook it depending of your preferred degree of cooking. Meanwhile, cut plum tomatoes into wedges and mix them with arugula leaves. Toss with extra virgin olive oil and some lemon juice. Add salt and pepper to taste. On a plate, put a slice of bread and pour some steak juices on it. Place steak strips on top of the bread slice. Arrange the salad on the place. Drizzle with extra virgin olive oil. Everything is beautiful here! 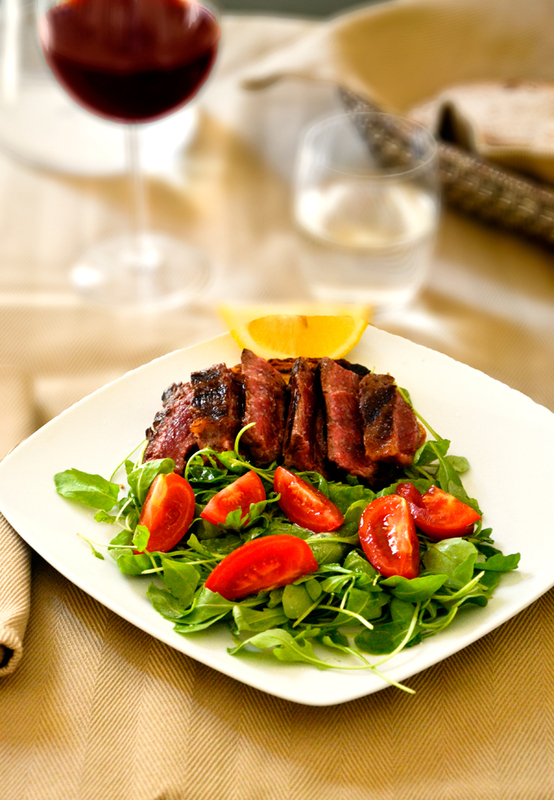 The photos, the arugula, the tomatoes and, of course, that lovely steak. I’m having my next steak on country bread! Thanks for the idea. You’re welcome!!! Thanks for all the compliments !!! And thanks for inspiring me on this dish too!!! Now that does look amazing! Like you, I don´t eat meat all that often becuase we have so many vegetables, and here it tends to be pork rather than beef (which I do miss). 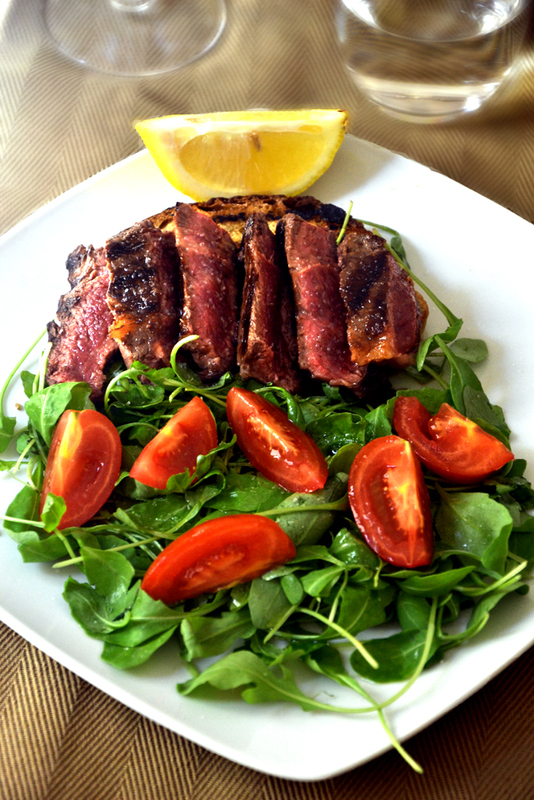 This steak looks perfectly cooked for me and I love all the juices that drip out…oh dear, the cravings, the cravings! Gracias Chica!! 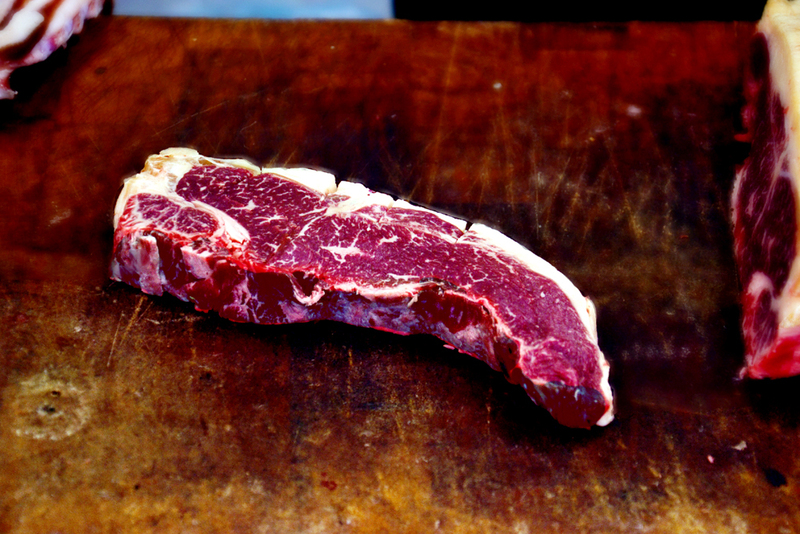 We also get more pork than beef in Italy, but we get great steaks from Tuscany and Piedmont! Aren’t those juices that dip out from steaks so fantastic! It would be such a shame to discard them!!! I am a steak and potato guy, but if the steaks this good a salad is all you need. This looks fantastic. I love potatoes too!!!! My Oh my!!! But sometimes I feel bloated when eating both potatoes and steak at the same time. This is why I prefer a simple light salad!! I prefer to have my steak in a salad too; kinda makes it a less guilty dinner that way, but also I love the chilled salad with the heated steak, and oh my on top of toasted bread, that really sounds amazing! I am eating so much bread lately that I just cannot eat something without bread…specially salad! Yum! Your salad looks simply delicious. Thank you!! I love the bitterness of arugula with the sweet taste of tomatoes!! Hola Ambrosiana! Qué buena receta: simple pero rica rica. Ahora entiendo porqué hablas tan bien el español! Jejejee!!! Si asi es siendo de Honduras, hablo español y catracho (asi nos llaman tambien a los Hondureños)!!!! Perfect Ambrosiana and I completely agree that steak should be the star. ! That is one amazing looking cut of meat. It actually looks good enough to eat without even cooking it! Ah!!! You are a genious!!! I think a steak tartare must have been amazing!!! Red meat is good sometimes…but that “sometimes” should be of top quality!!! Fabulous photography, and I love the reportage shots at the butcher’s. Great looking post. Merci teacher!!! You have no idea how hard it was taking those picture. Lighting was poor and people stared at me like the looney one!! Your mention of bread and the steak’s drippings brought back memories of my Dad. When steak was served, he’d often finish off his meal by dipping a bit of bread into the juices left behind on the steak’s serving platter. Like you, he knew what was good. Thanks for sharing a great recipe, beautifully photographed and served with a bit of nostalgia. awww..that is sweet!! Dipping bread into pasta or juices of any kind is so Italian.In Rome it is called making “la scarpetta”!! The steak looks wonderful and I agree about the salad as a light accompaniment. I don’t eat steak very often because I think that beef production is unsustainable and bad for the environment but I love it and so I do succumb to temptation occasionally. At home we eat more pork because that’s what is available and eaten locally. But being Welsh (not from Sussex – it’s Lo Jardinier’s family who come from southern England) I love lamb most of all! Thank you!!! I just love going to my butcher. He not only has great products but his so special with all his customers! Thank you RaeDi. I take it as a big compliment coming from you!! I couldn’t help but think of the “beef steak Florentine” that we get when traveling in Tuscany. Your steak looked great, aged and with a nice amount of fat for flavor and tenderness. As you can tell, I do like a good piece of meat every once and a while and when I do…I want it to be special. Your photos were absolutely great! Someday sounds good to me. Your photos are absolutely beautiful! Thank you!! Bread with steak is a great combo!! Thank you!!! I prefer steak with salad so I thought I shared this!